Pack Now stocks SFK Corrugated Packaging . 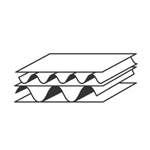 Buy SFK Corrugated Packaging by the meter or by the roll. Pack Now stocks SFK corrugated rolls in 1,2m & 1,8M by 60m lengths. Protect your furniture and appliances with corrugated sfk roll from scratches and dings.